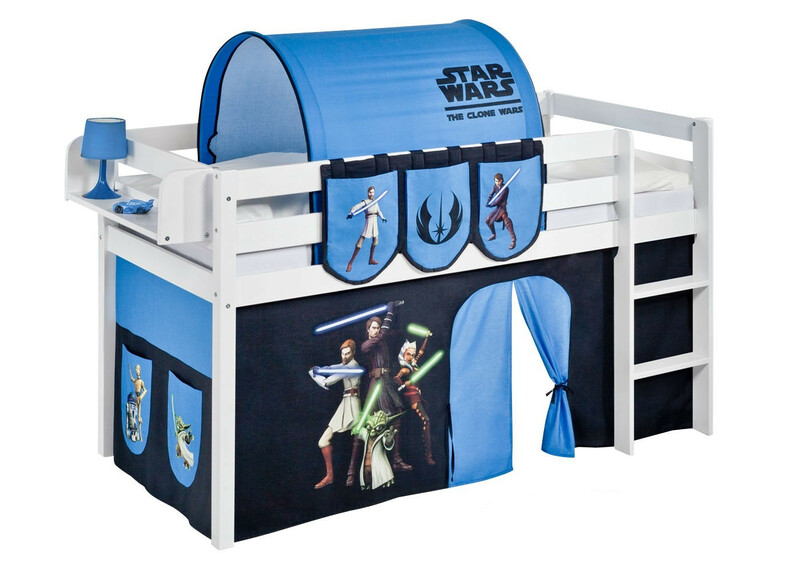 LILOKIDS beds not only invite to sleep and dream, but are the ideal timeless play bed. Because of the different colored curtains with or without a motif, the mid-sleeper offers a small retreat for your child, setting no limits to the imagination . So that the bed fits perfectly into every child's room, you can mount the ladder either on the left or right side. For children's furniture, not only the fun factor should be at the top, but also the safety. Therefore, our childrens beds all contain a border frame as fall protection as well as a post strength of 54x54mm which thus make our mid-sleepers a secure bed for children. We provide a robust construction for all childrens beds according to the standards DIN EN 747 for childrens high sleepers and bunk beds. Please be aware that our accessories like slats, bookshelf, mattress, tunnel, pockets and decoration are not included. You can either tick the boxes above to include them or order them separately under "beds & accesssories".